Home Fitness India’s True Triathlete Lady! “Breathe!! Kick harder!!! Kick Faster!!! No breaks Rachna keep moving, water is your friend!! !” my swimming coach late Subodh Danke yelled this sentence at me like a daily dose of medicine! I was thrown mercilessly into the water at the vulnerable age of seven years. My mother had all the right intentions for me but at seven, it was hard for me to figure on whose side she was when I swallowed pails full of chlorine water, belched and almost drowned a couple of times ! The woman (read my Ma) was a notorious slave driver when it came to learning a new skill and today, for that, I will be eternally grateful. It’s because of her, I am a true blue triathlete today! I trained every day at Khar Gymkhana, Mumbai for two hours every evening post school. The first hour was swimming drills, followed by another hour of endurance building by swimming at the same pace using the same stroke. My coach used to revamp my schedule on a weekly basis. If it was endurance building one week, then it was speed training the next and resistance training the following week and so on and so forth. The training program was designed tough as I was training for Maharashtra State Level Championships. It was a lot of pressure to perform up to speed and the training plan was to be followed diligently. Simultaneously, being very fond of sports I was playing field hockey and was part of my school team playing interschool matches. Interestingly I found that swimming made me a better hockey player! Ironic?! Not really, what swimming did for me was improving my lung capacity, improved my V02 performance and generally made me stronger, fitter and agile. These days it’s called “cross training with swimming,” but, the days I was growing up scientific theories weren’t explained, we just did what the coach asked us to do ( hoping quietly that he knew what he was talking about !) Now we have an information overload to validate scientific research in sports. In the late eighties with this level of coaching, training and discipline I had podium finishes at the State Level Championships two years in a row. With my increasing involvement in sports and water sports specifically, I got PADI certified (Professional Association of Diving Instructors, certification). Over the last couple of years I have broadened my sports horizons by investing in both time and training for competing in several Triathlons of varying distances and my last two podiums have been in Olympic distances (1.5kms swim (open water), 40kms bike, 10kms Run and Swimathons . I tend to be bit of a loner and do my training alone however I do enjoy the occasional company of fellow trainers. With several swimming experiences under my belt I have realized that swimming in Pools versus Open waters, pool swimming is the lesser evil and relatively easy. Open waters, especially sea swimming tends to be not only scary but very challenging because of underlying water currents, high tides, low visibility and poor sighting. It’s not everyone’s cup of tea and the fear of water can easily put this sport on the back burner for many. I enjoy swimming in fresh water lakes and feel a true swimmer is one who can take on any open water variety. I’m often teased with names like “Water Baby, “” aquamarine”, “Mermaid “, “Triathlon Queen” and some more creative statements such as ” Rachna doesn’t have legs she has fins’. Given our Indian cultural setup many a times I’ve been asked “what am i doing in a guy’s sports, you’ll get all tanned and burned training in the sun, no?,” ” Your hair will get ruined in salt water and chlorine pools “…Such statements only keep me going further towards my ambitious goals, and my answer to such questions is “I’m not afraid of the sun and I carry my tan around like a trophy. ” Triathlons keep me excited and eager and I enjoy training for them though they are quite taxing on time and the body as it is training for three individual disciplines. Sun burns from training at odd hours. My badges of honor. Swimming being my strongest discipline and frankly my most cherished one I train throughout the year in it. After a knackering kidney infection I find that water being the kindest of terrains my body doesn’t stress from dehydration and climatic changes if I resort to swimming. Swimming has not only made me disciplined in a matter of never giving up, it has nourished my life in a way that running and meditation couldn’t. Somehow the movement of forcing oneself forward against resistance of water makes for not only physical strength but emphasizes mental focus. For me, “Home is where the pool is” and even on Beach vacations one can find me among scuba divers, snorklers and water sports enthusiast! This soft spoken 40 year old mom of a teenager has a huge fan following. Eclectic, humble, compassionate and crazy about sports, Rachna is perfect water daredevil. 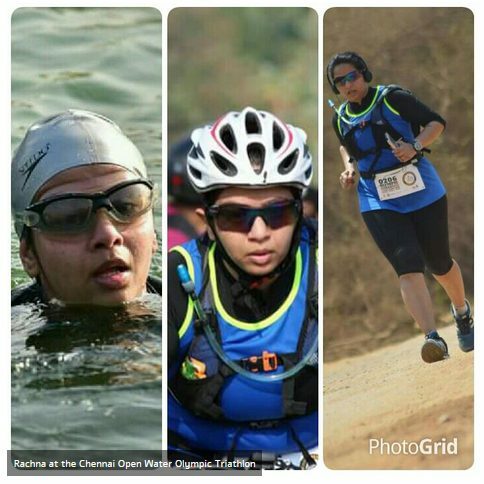 In a love relationship with water, she goes on proving it by participating and winning various Triathlons, both Hyderabad Triathlon and Chennai Triathlon being her recent podium finishes. She describes her Swimathon Goa 5km (sea swimming) as a life changing experience. Despite being a cynical runner she has done 6 prestigious half marathons and countless 10 km runs. A two times Maharashtra State Level Swimming Champ she is deserver of every medal and trophy she has brought back home. She is a super hero…. Down to earth and very helpful too. She was one who I looked for guidance in my maiden triathlon and who inspired me to go for it. A super human being. Keep it up Rachna !! Ironstuff !! Rachna, very proud of you! Enjoy every minute of your life! Only pure hard work and determination can fetch such podium finishes.. Awesome ! wishing you many more podium finishes. Wow Rachna you are truly a super women!! For a person like me whose dead scared of water (don’t laugh now) after reading your blog has ignited that fire n me to go n jump..
You’ve always been a go-getter n I really admire u for that…Cheers to your winning attitude! !